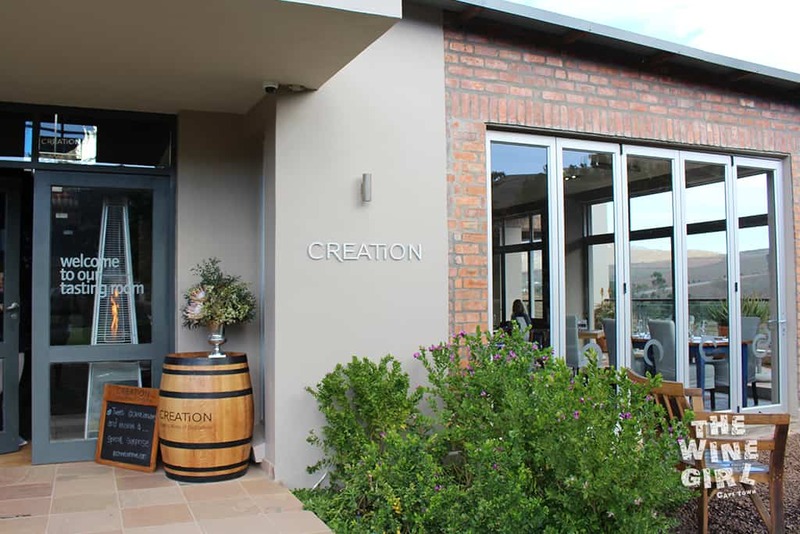 This farm was absolutely, food and wine pairing heaven at number 63 of 800, Creation Wines in the Hemel-en-aarde wine valley, Hermanus. What’s interesting is that this farm has never grown vines before. 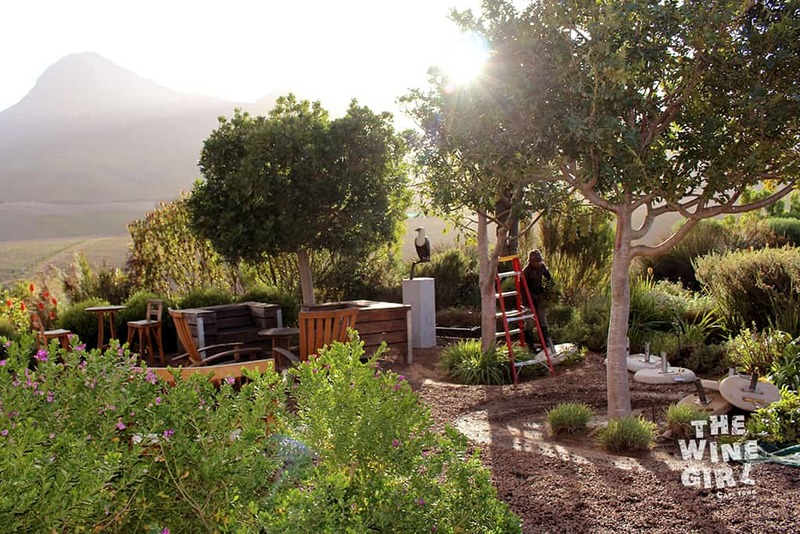 The land was purchased by Swiss born, Jean-Claude (JC) and his South African wife, Carolyn Martin (maiden name, Finlayson, which is well known in the area) in 2002. 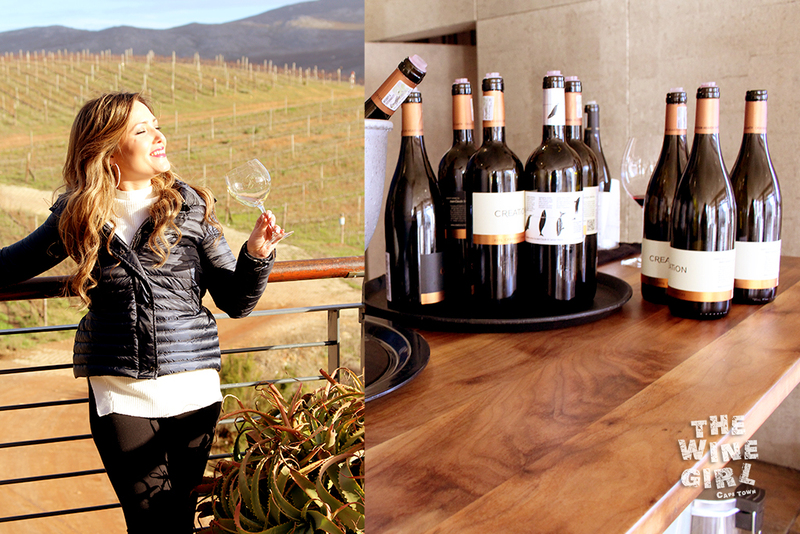 Both have come from 3 generations of wine pioneers and took up the challenge to transform this once baron land into a 40 Hectare wine estate. 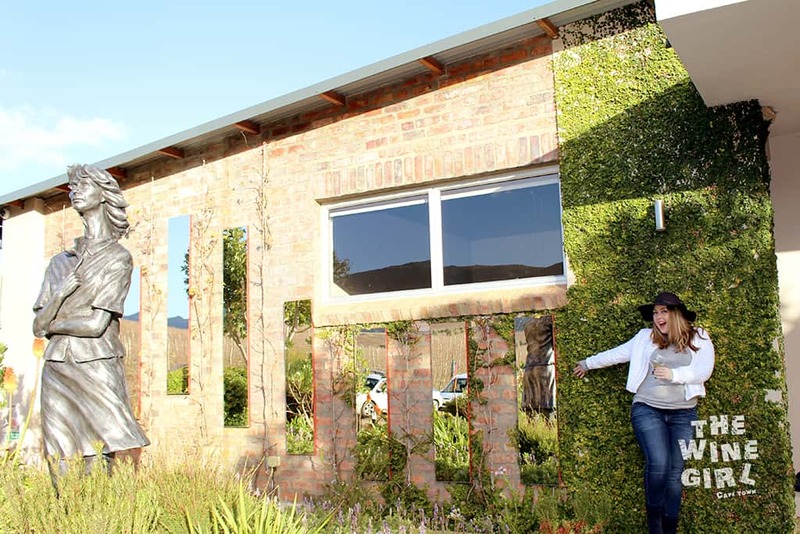 This farm is situated 350 metres above sea level on the Hemel-en-Aarde ridge which creates the perfect, cool, climate and soil type for great Pinot Noir and Chardonnay. 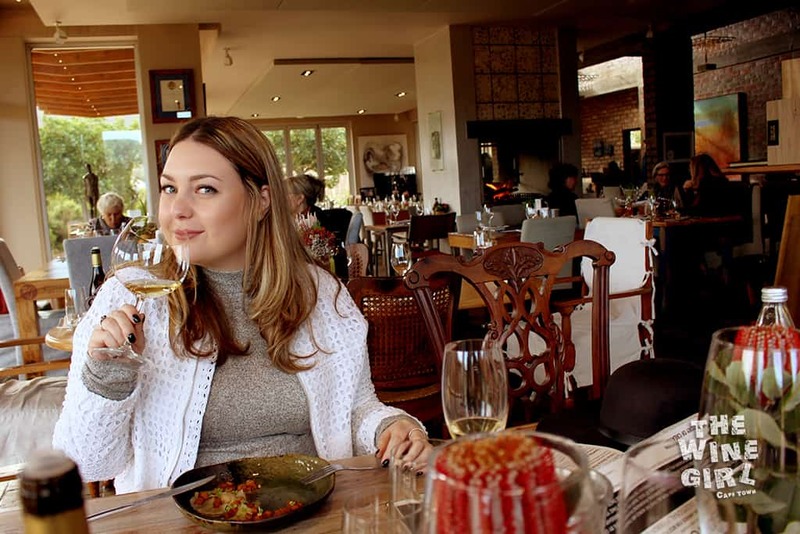 “The vines bask in generous sunlight, flourish in 450-million-year-old clay loam soils with decomposed Bokkeveld shale and dance in the cool breezes blowing in from the nearby Atlantic Ocean. 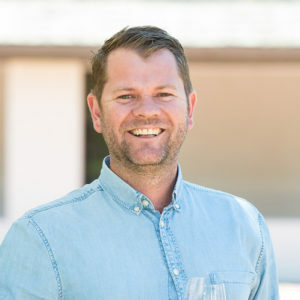 During the annual growth period, temperatures rarely exceed 30° C, while the cool night index throughout the year is 12° C lower than the day-time temperature.These factors result in full-flavoured grapes of outstanding quality, allowing for the creation of complex wines with length and depth.” – Creation Wines Website. 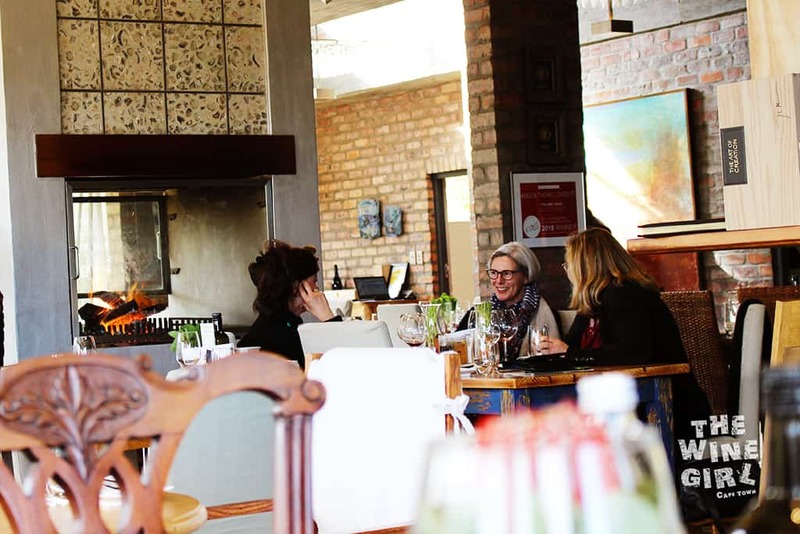 WINE TASTING: There are so many options available including a Brunch pairing menu for R425, a 7 chapter food and wine pairing experience for R335 and there is even something for the kids! CLICK HERE to view the tasting menu options. It is exceptional good value for money and I applaud them on such a great offering. 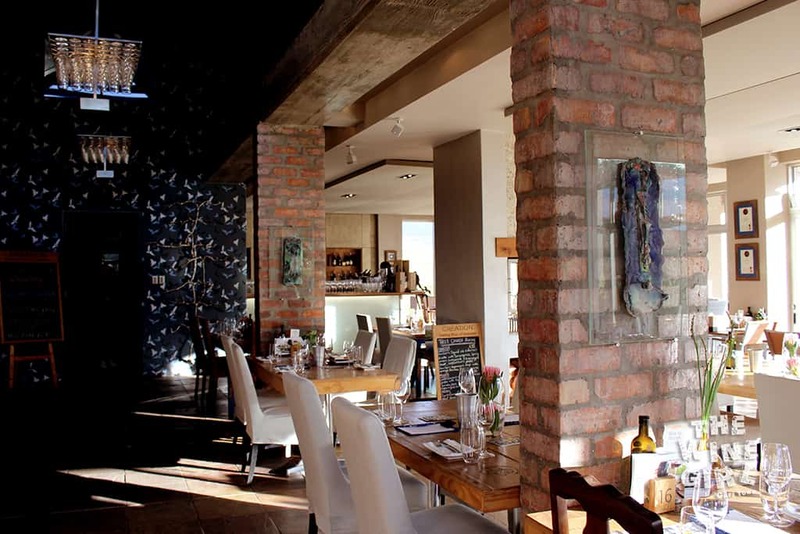 RESTAURANT: The tasting room doubles up as a restaurant so definitely visit when you are hungry! CHILD/PET FRIENDLY? I would not recommend pets but kids are very well looked after here with a kids play room. 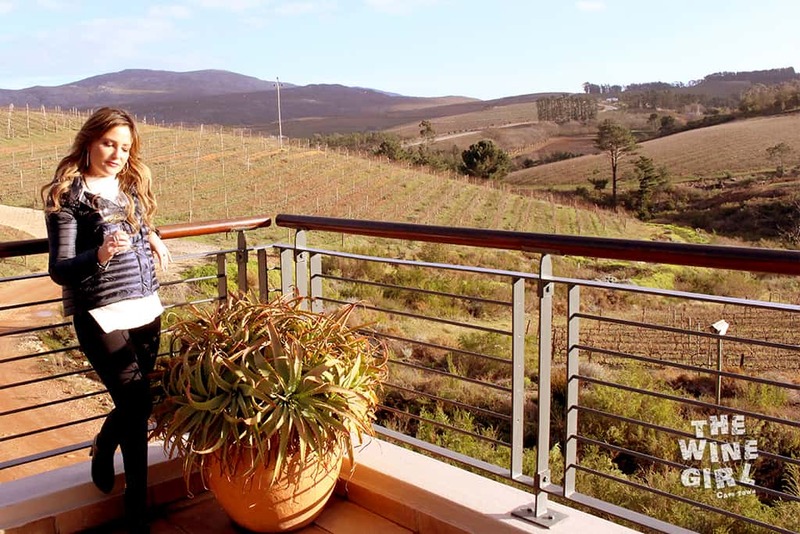 The parking area is not far from the tasting room however there are some steps to climb. For those who cannot climb stairs or are in wheel chairs, this farm is actually quite good because you can drive the car closer to the entrance for drop off. (note the cars in the mirrors). The decor and furniture is very tasteful, modern and sophisticated yet it still felt very homely. 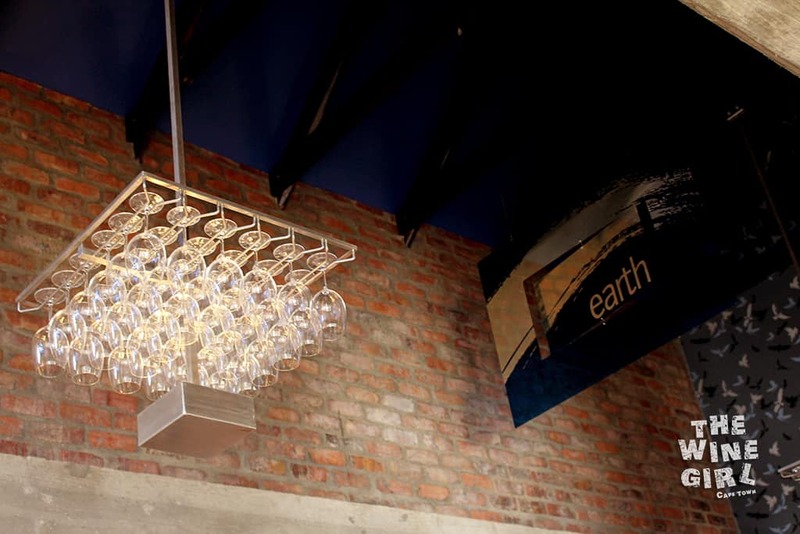 This chandelier, made from wine glasses, is awesome! Speaking of glasses, Creation only serves wine in the best crystal glasses you can get. Riedel. Just don’t break them, it is around R500-R800 a glass. Definitely not a venue for drunk students – lol, let’s show some class here. 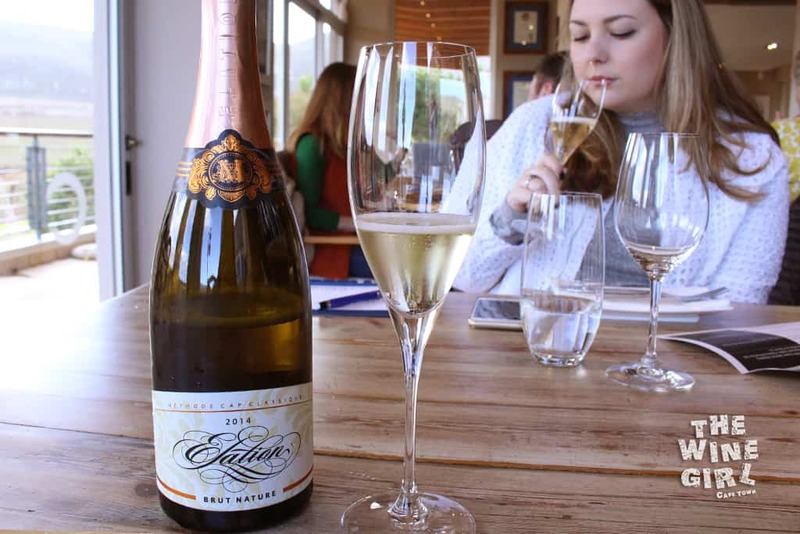 To get your taste-buds going, I would recommend starting off with a tasting of the MCC Elation Brut 2014. It’s a blend of Chardonnay and Pinot Noir. On the nose, it has a good citrus scent of apples and lemons. On the palate, good tiny bubbles and a well rounded brioche aftertaste. 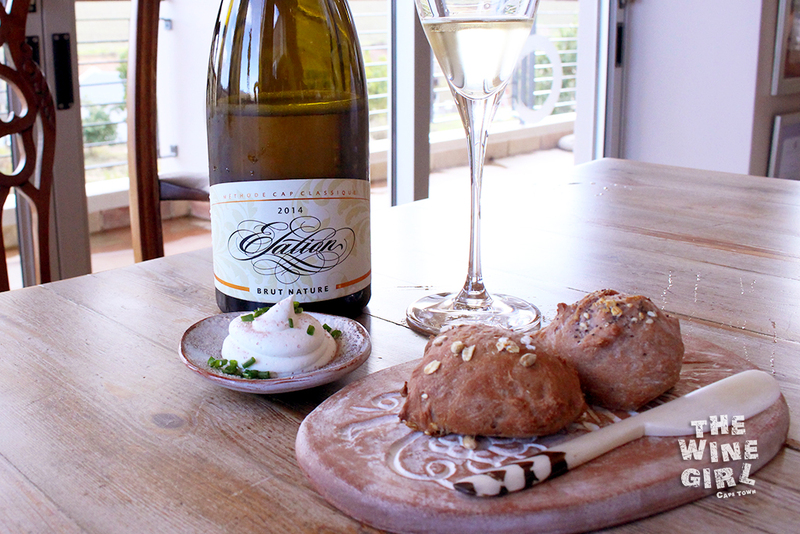 It paired perfectly well with freshly baked bread. 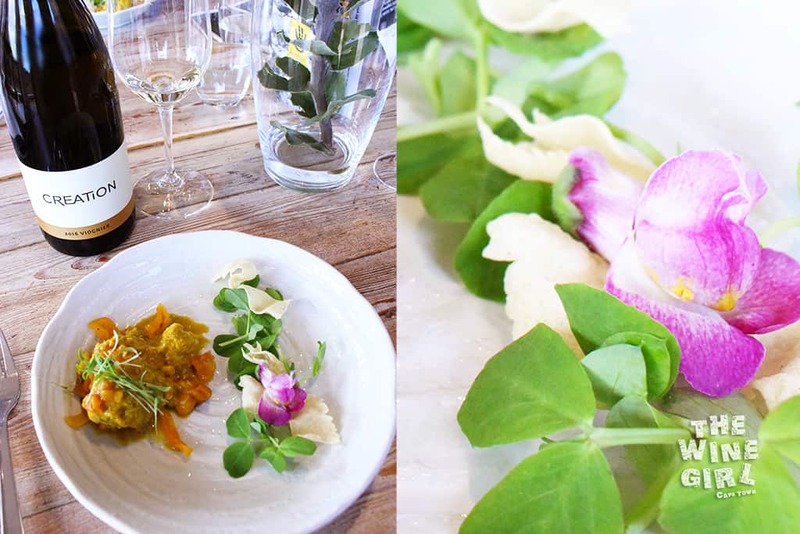 It is served with an incredibly tasty spread, sprinkled with Pinotage salt and chives! I was booked for the brand new, 7-chapter, food and wine pairing experience. It is called 7-chapter and not 7-course because it takes you on a journey on the story of creation. 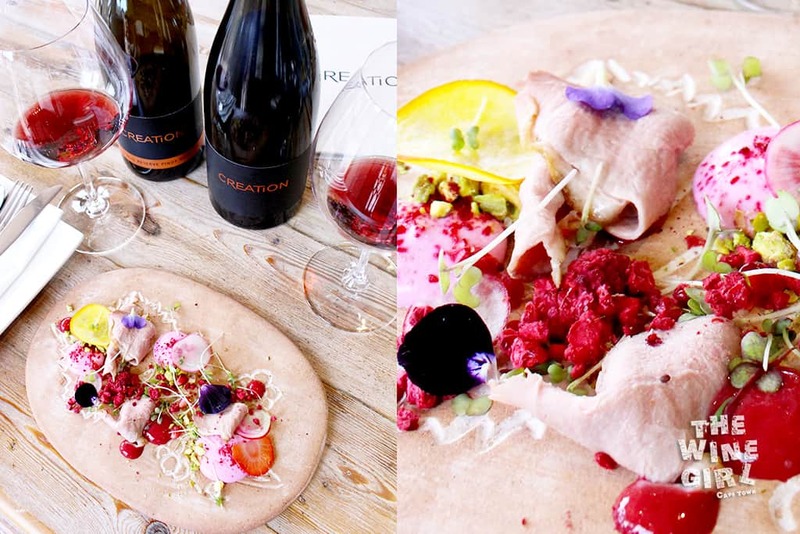 Each dish is artfully presented to compliment each wine plus reflects the local traditions. Each course is perfectly presented and a story is told with each serving so do be sure to book around 2 hours. We started off with a vertical tasting of a 2016 Sauvignon Blanc Semillon and a 2017 Sauvignon Blanc (served in differently shaped glasses). The 2017 was crisp and fruity, full of tropical fruit like guava, ending with a green pepper and cassis finish. The 2016 had a bit more of a kick and I could definitely pick up a more salty element from the fresh sea breezes in the area. An incredible, Bordeaux style white (R150 a bottle). The eye candy on the plate, represents the beginning and it looks like an egg in a nest. 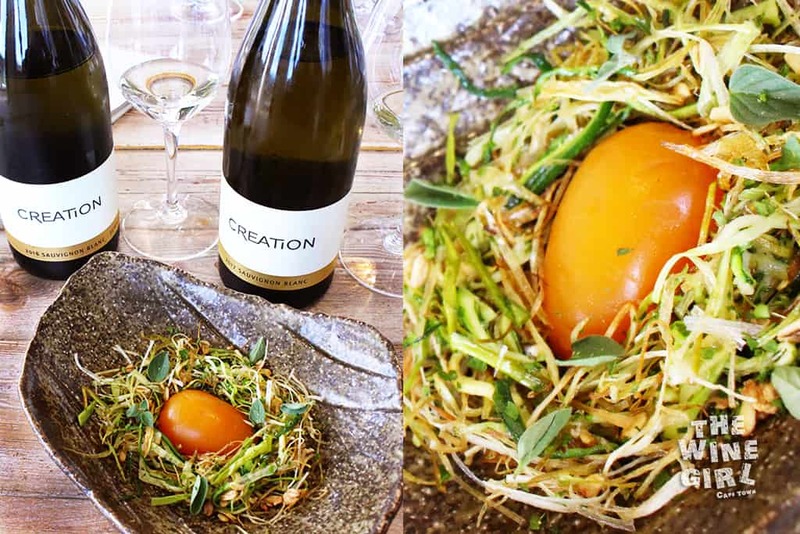 The egg is made from a type of passion fruit and pawpaw jelly and the nest of flavours is of crispy leek, baby marrow, origanum and even granola. The taste sensation of textures was mind blowing. It paired exceptionally well with the wine! Chapter 2 started to blossom! Literally! This is a very traditional meal here in SA, pickled hake with papadum spice, sweetcorn, coriander and apricot. The crisps were lightly salted and the flower added just the right amount of bitterness/sourness. It was paired with a wonderfully fragrant Viognier 2016. Think apricot, peach and even a slight hint of coconut – I kid you not, you can smell it! On the palate it had a very good acidity which helped to cut through the fragrant, creamy spice on the hake. Chapter 3 was an intersting dish for me. It was at this point that I noticed that each dish was really unique. 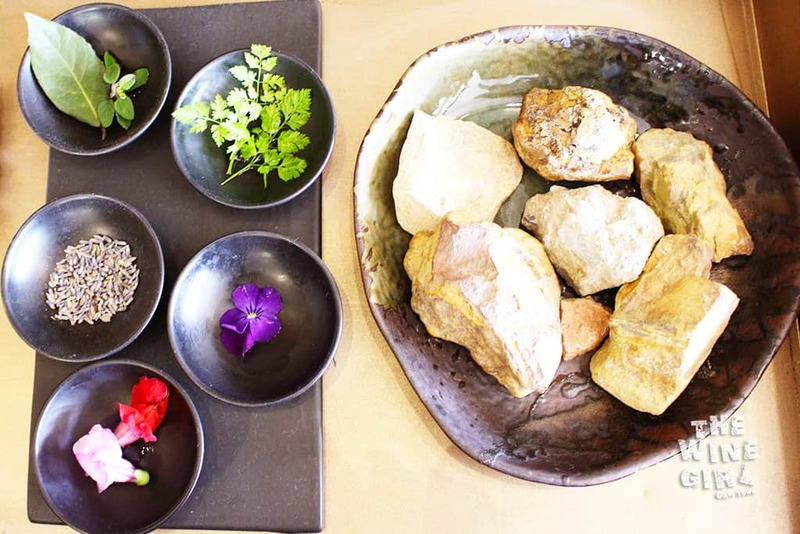 The pottery is especially designed by local potter – Setamono Tableware – which has inspired me to get a whole bunch for home! This was a smoked salmon ravioli dish, served with cinnamon coated, roasted pumpkin and drenched in a Chai Tea sauce with orange and butter reduction. YUM! 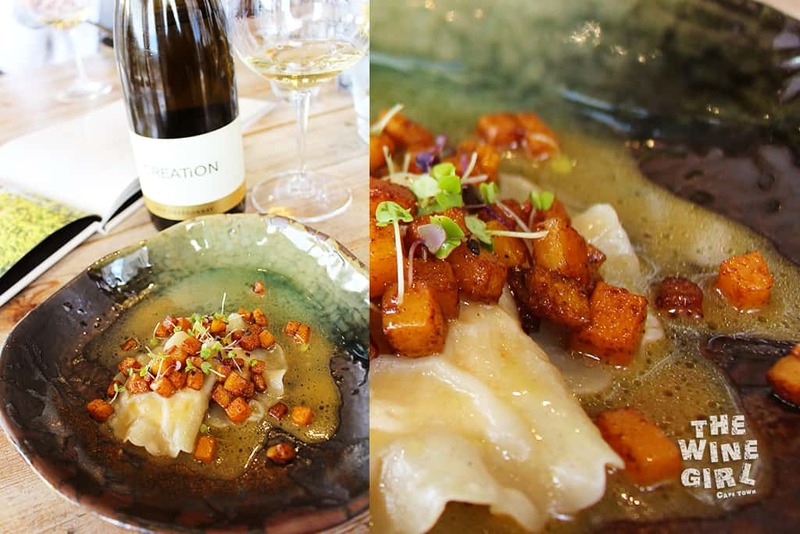 When ever I think of cinnamon coated, roasted pumpkin, I think of warm, cosy fire places – creation had this too and I was in heaven at about this point 🙂 This meal was served with a wonderful Chardonnay 2016. Good notes of pears and peaches with a fresh, vanilla minerality. Now the next course is definitely something that I have never tasted before. A Pinot Noir Reserve 2015 paired with smoked duck breast slivers! On the side was fresh fruit, flowers, goats milk cheese, radish and pistachio nuts. 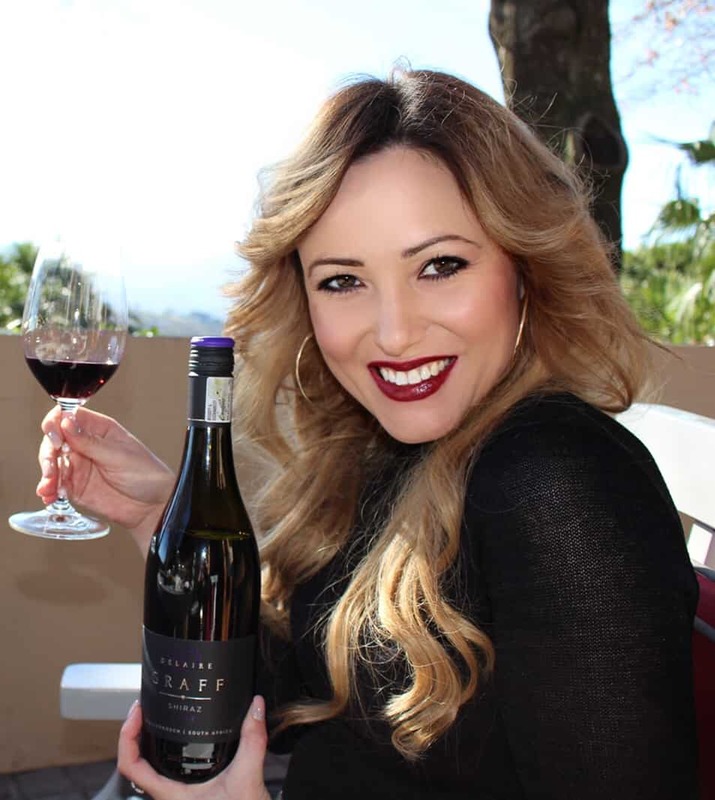 I was really lucky to be able to compare the 2015 Pinot to the black label Pinot Noir (The Art of Creation). This wine is not normally for tasting because only 1200 bottles were produced. The 2015 had a great peppery undertone on the nose. On the palate, it had a great berry entry, which ended off with a well supported piquant spice. 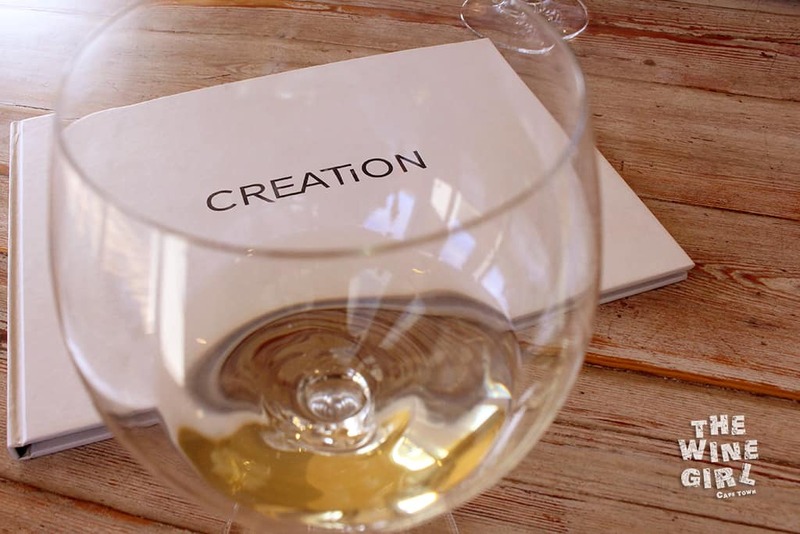 The Art of Creation, black label Pinot Noir, was just out of this world amazing. Only the best bunches were used for this wine and special care was taken to ensure maximum quality. On the nose, I could pick up roses, cherries and a hint of spice. It then opened up on the palate with fabulous plum and even spicy, mushroom flavours. (R875 a bottle). The bold flavours of the dish, really complimented the wine. 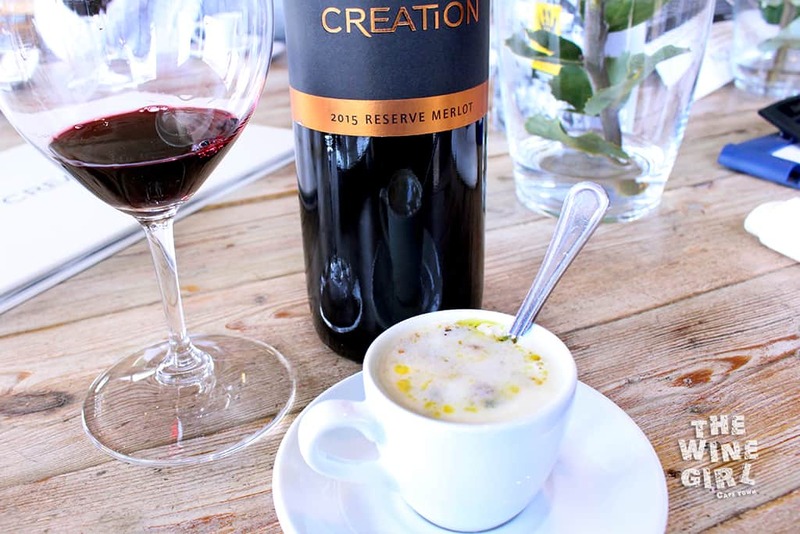 Chapter 5 is a Merlot Reserve 2016 paired with the very famous Cauliflower soup. The soup had blueberries in it! And this is what paired really well with the Merlot. The Merlot, on the nose, had quite a complex blend of berries, nuts and even cigar box if you keep going back to it whilst sipping on the soup. The wine was very smooth on the palate and the warming soup just paired wonderfully with it. Who knew! If you enjoy lamb and red wine, then you will really enjoy chapter 6! A Creation Syrah, Grenache 2015 paired well with this dish. 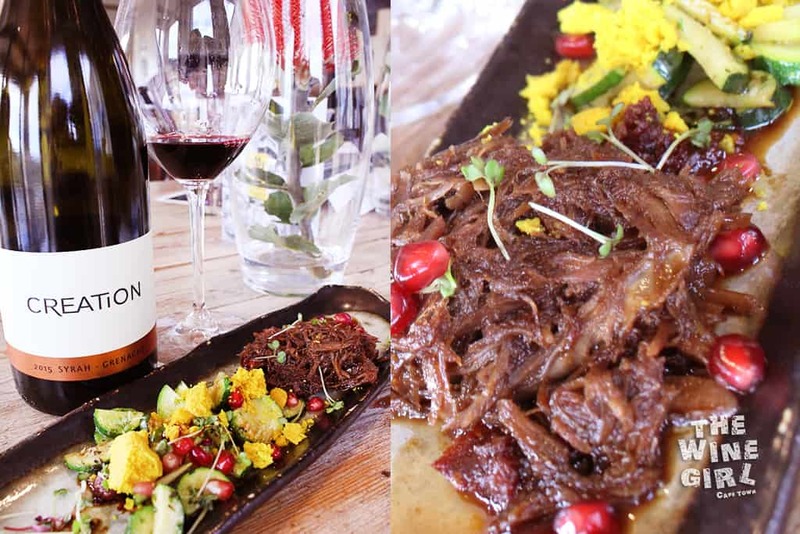 Lamb Shank sprinkled with pomegranates, served with curry powder crunchies and baby marrow. This Rhone blend wine is very full bodied as you can see by the dark colour in the glass. On the palate, ripe plums, black pepper, tapenade and umami. Finally, you will end off with chapter 7. Cheese sticks (boerenkaas, which is quite a creamy, firm cheese), served with fynbos honey, bee pollen and truffle oil. 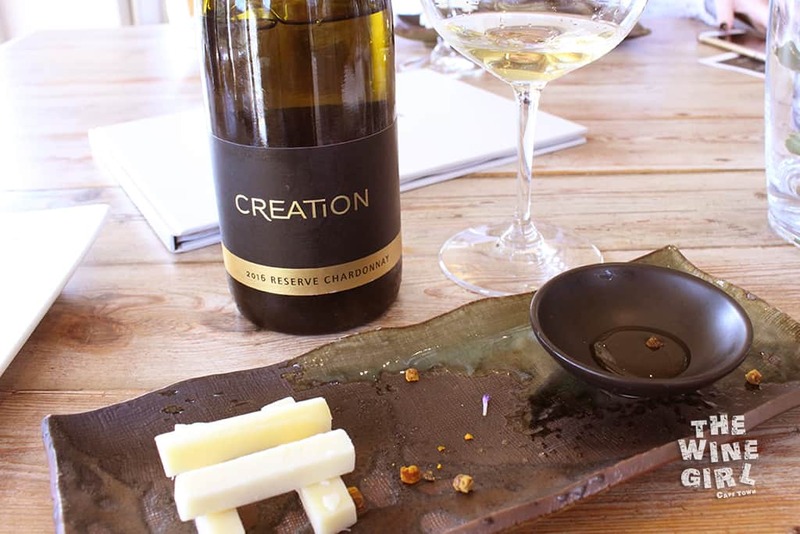 It paired well with the Creation Reserve Chardonnay 2016. The fruitiness of the wine (grapefruit an apples), was very well rounded on the palate by buttery nuances and good minerality. This is probably the longest blog post I have ever done, but wait, there is more! If you Tweet during your visit, you could get a sweet surprise – hint hint! Below is just a very small tasting of the chocolates on offer at the farm. Each chocolate was uniquely flavoured and represents what you should experience at Creation. This is: Passion, Charisma, Resonance and Deja Vu. 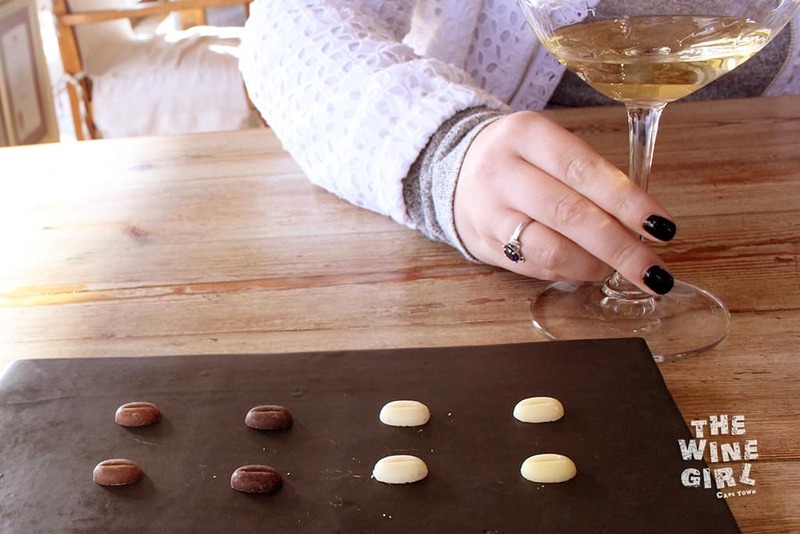 You can do the proper, bigger, chocolate and wine pairing for R105 per person. To top it all off, I would recommend ordering a delicious Nespresso coffee. 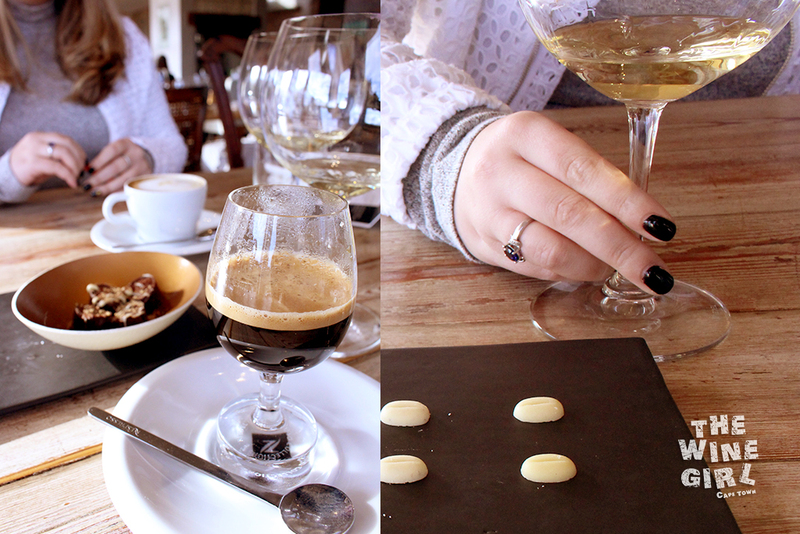 I had a double espresso, also served in a Riedel glass, how cute! Afterwards, I took a little look around outside. 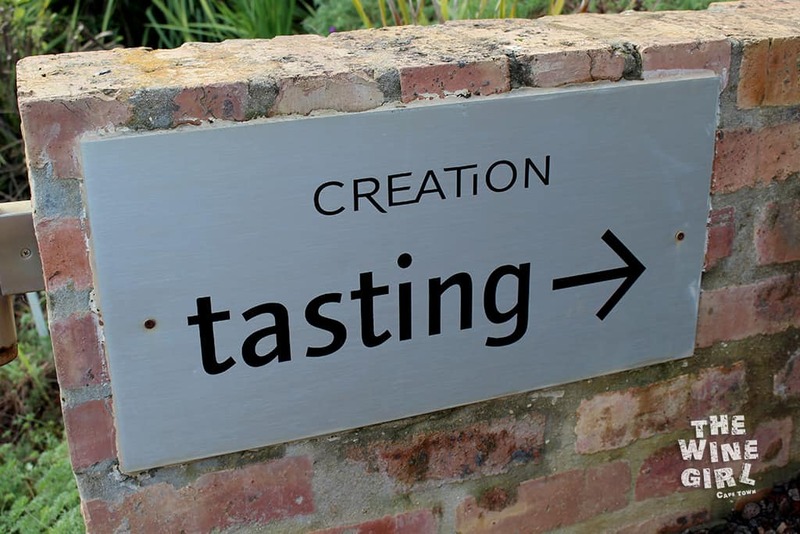 There is a great outside tasting area which will be good in the summer months. There are also quite a few sculptures on show and the gardens are stunning! I had a great time and I am sure you will too! P.S. there is some gravel road to get to this farm but it is quite well graded and oh so worth it! 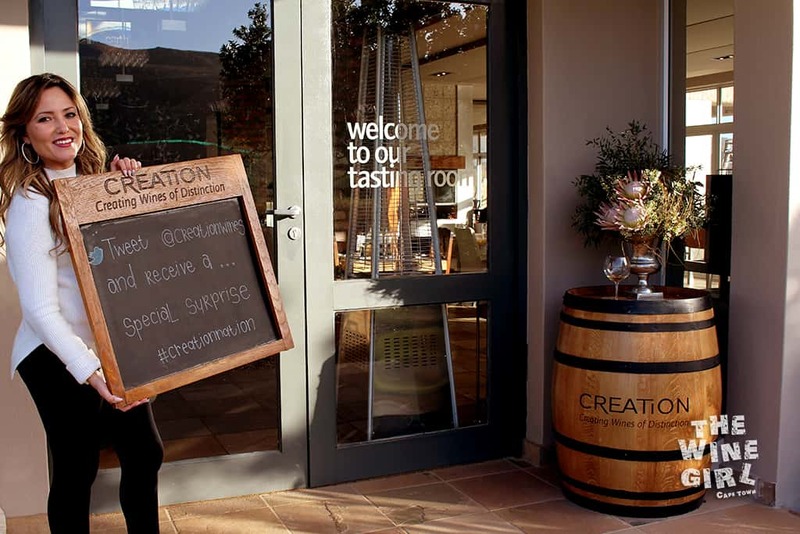 Tag me in your post when you visit Creation, I would love to see your experience too.